Join Kristi and your fellow bag makers for an evening of sewing a fun tote bag. Homework will be required in that you should have your bag cut out and interfacing applied prior to the class. Kristi uses SF 101 interfacing on essentially every bag piece, including the lining. This is usually IN ADDITION to fusible fleece or soft and stable. We will start working on our bags and then there will be homework if you want to get your bag to the point of being able to add the finishing hardware in the second class. Kristi will provide an overview of the pattern and her tips and tricks for making the bag. We will then spend the rest of the evening sewing. Feel free to prepare pieces you feel comfortable preparing (handles, pockets, etc.). In this class we we will be creating the Mega Bow Tucks Bag (Pattern by Quilt Illustrated). This is a generous sized tote bag. It uses some fun hardware such as swivels and turn locks. 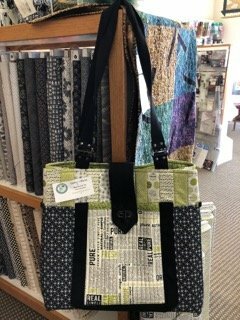 Quilter’s Haven will have the Mega Bow Tucks Tote and Wallet Patterns – please purchase when you register and pay for the class. You will need the materials listed on the pattern. You will also need pattern trace if you do not wish to cut apart your pattern. Quilter’s Haven has all of the hardware you will need for these bags. I also added bag feet to my bag so if this is something you would like, you should purchase those as well. Prior to class, you should cut your tote out and and fuse SF101 to each of your pieces. So - Let’s make a bag!! Cost of class does not include the pattern, fabric and hardware. Requirements: Quilter's Haven will have the Mega Bow Tucks Tote and Wallet Patterns. Please purchase when you register and pay for the class. You will need the materials listed on the pattern. You will also need the pattern traced if you do not wish to cut apart your pattern. Quilter's Haven has all of the hardware you will need for these bags.